This easy coconut rice pudding recipe is brought to you in partnership with my friends at USA Rice & TheFeedfeed. All opinions are my own (duh). Thank you for supporting the brands that make this site (and my savory desserts) possible! I first became obsessed with the concept of “rice as dessert” in Thailand. 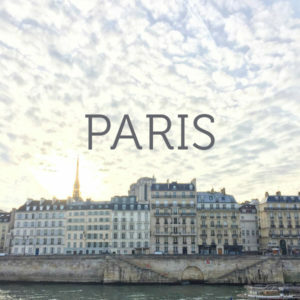 You’ve heard about the low’s of this trip, which included sickness-induced fever dreams. But the high’s included non-sickness induced fever dreams of various Thai street food, which contained some of the most exciting and funky flavors my 16-year-old palette had ever encountered. Before I left, I was a basic cupcake girl. When I came back, all I wanted was sweet sticky rice with mango in a banana leaf. As you can imagine, such things in their most authentic form were hard to come by on the Upper West Side. So instead, I took to making my own riffs on rice-based desserts, including many variations of this coconut rice pudding recipe. What Thai-inspired rice puddings have on their gloppy American cousins is that you can really taste the rice. People don’t usually think of rice as having its own fragrance, but depending on the variety, you can tease out a beautiful nuttiness, slight spice, or floral aroma. 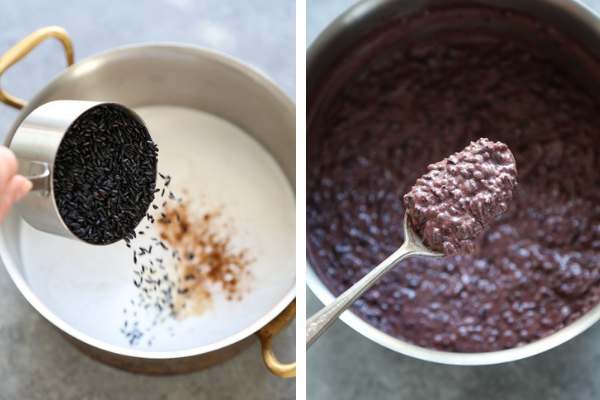 I love using coconut milk in rice pudding both for the dairy-free factor, and also because it’s naturally thickening and compliments rice so well, especially this version with black rice. Black Japonica is an aromatic, 100% whole grain rice with a dark black bran (meaning, fiber for the win!). When cooked, the grains are slightly chewy with a subtle sweet spiciness. 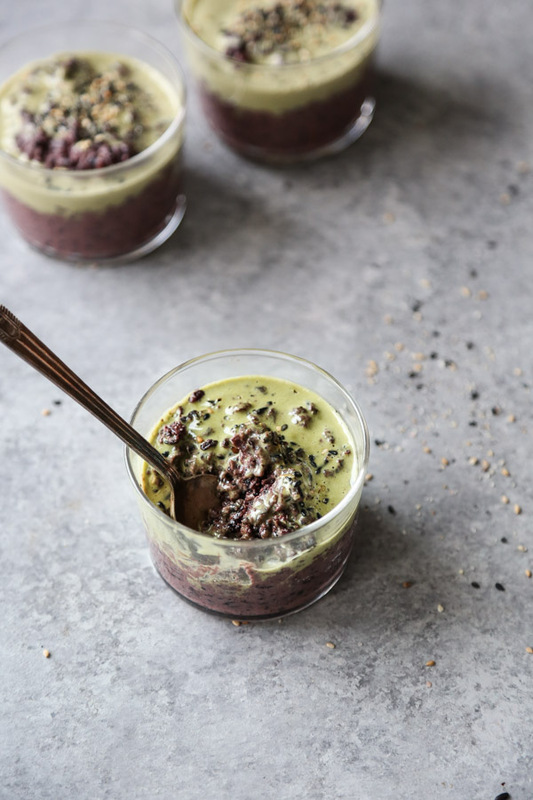 And in the case of this black sesame coconut rice pudding, it means the end product has wonderful texture while being incredibly creamy. 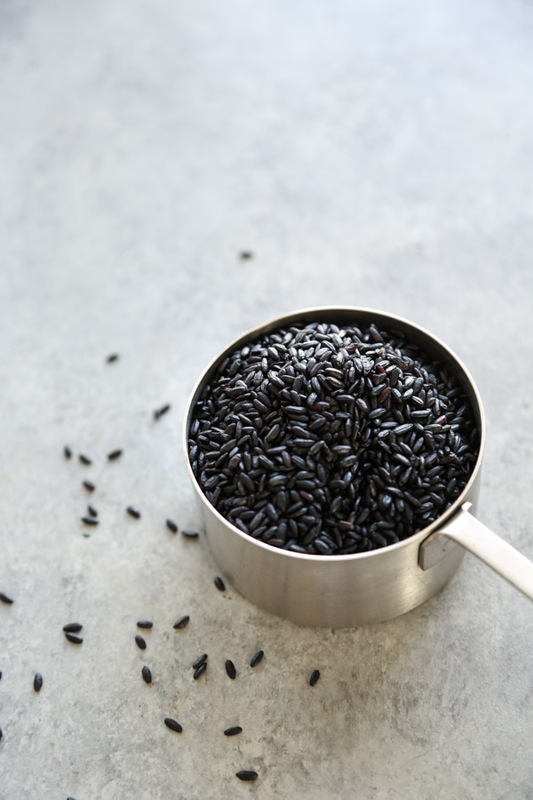 Did you know that a lot of black rice is actually grown right here in the US? If you’re curious where your rice comes from and want to try to source locally rather than overseas (which, with an eye towards sustainability, I always encourage), simply turn over the package and check for the USA Rice logo on the back or see where it was grown. 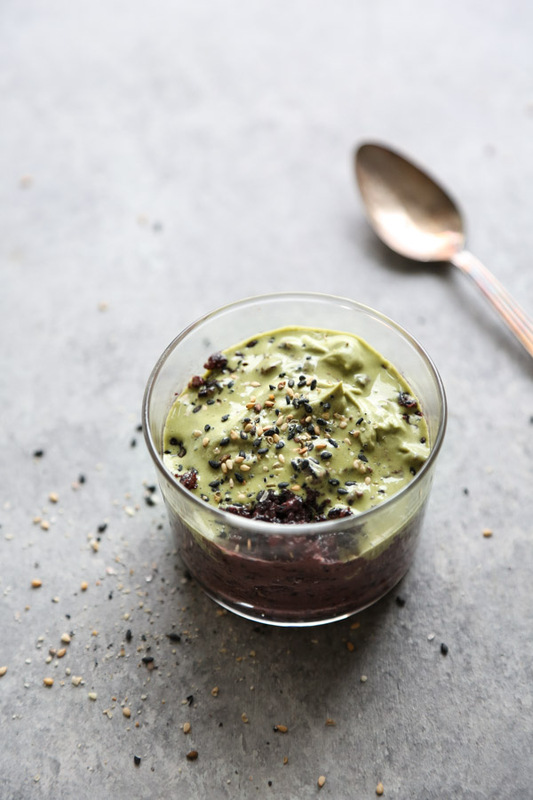 Usually, when making the Japanese-inspired ice cream, you pulse a bunch of black sesame seeds in a food processor to create a paste and then mix it into the cream mixture. 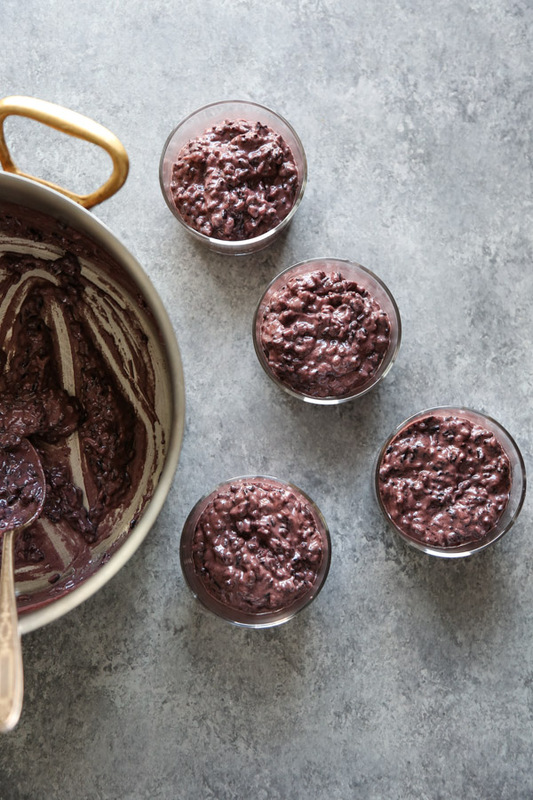 In the case of this black rice pudding, I use a little hack thanks to the actual color of the rice: instead of using black sesame seeds, I just added a few tablespoons of tahini to the pudding. This thickens it further and also saves you an appliance to clean. You still get the wonderful sesame flavor and nuttiness, but without the hassle. 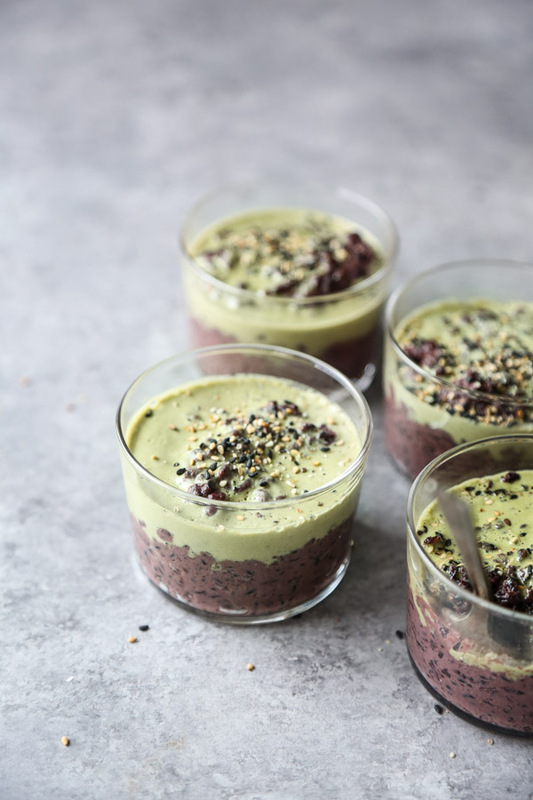 Read on for this black sesame coconut rice pudding recipe with US-grown black japonica and a dollop of matcha cream on top. It’s a perfect spooky recipe for Halloween with far more fiber and less sugar than anything else on offer. 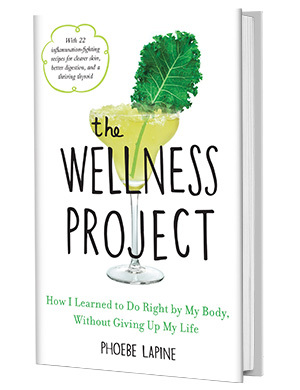 Please give me some creative ideas for what to call it in the comments section…my creativity has stalled on the word witch. If you like a creamier pudding, I suggest enjoying this coconut milk rice pudding straight from the pot. But it also makes for an amazing make-ahead dessert recipe that’s elegant enough for company. 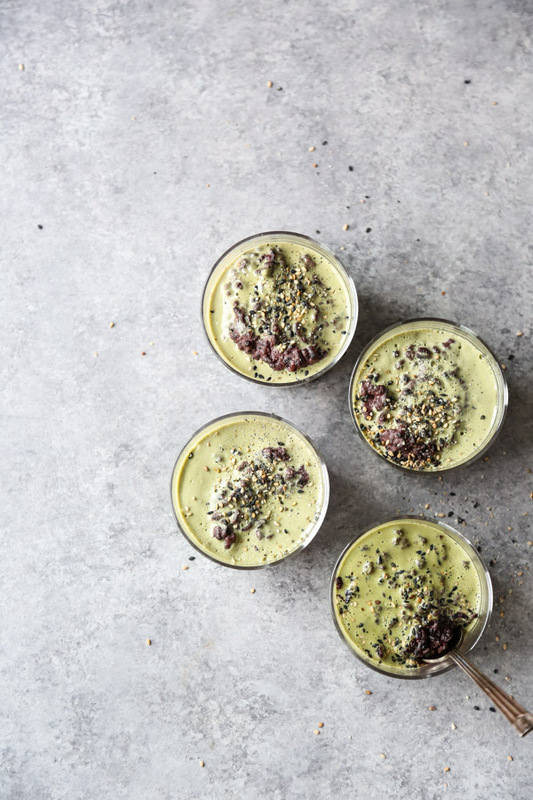 You can serve the matcha cream on top so that it melts and then freeze or spoon it on right before serving. 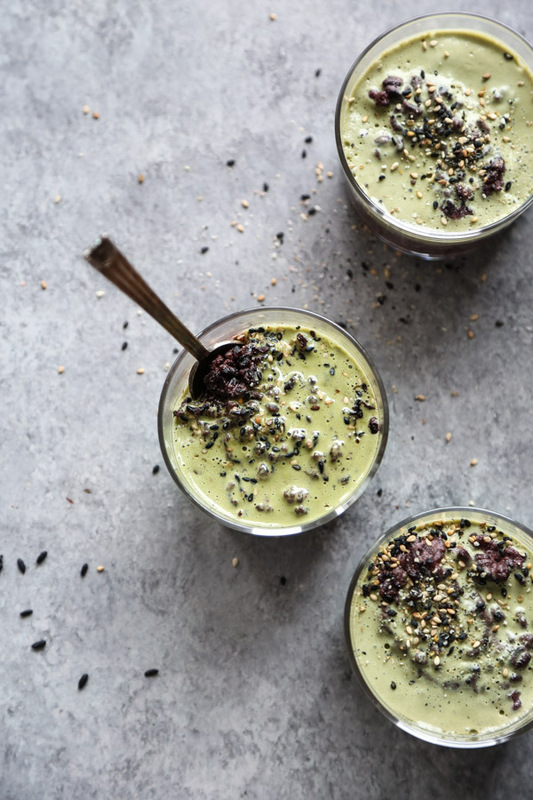 Either way, you get a beautiful contrast between the black rice and green matcha – a perfect palette and healthy sweet treat for Halloween! In a medium saucepan, combine the rice, remaining coconut milk (the liquidy half), almond milk, 4 tablespoons maple syrup, coconut oil, vanilla extract, cinnamon and salt and bring to a boil over medium-high heat. Be careful not to let the milk foam up and over the pan as it begins bubbling. Turn the heat down immediately to medium-low. Cook the rice, whisking occasionally during the first 10 minutes, and more frequently during the last ten minutes when the mixture has thickened, until the rice is al dente and the mixture has thickened, about 25 minutes. 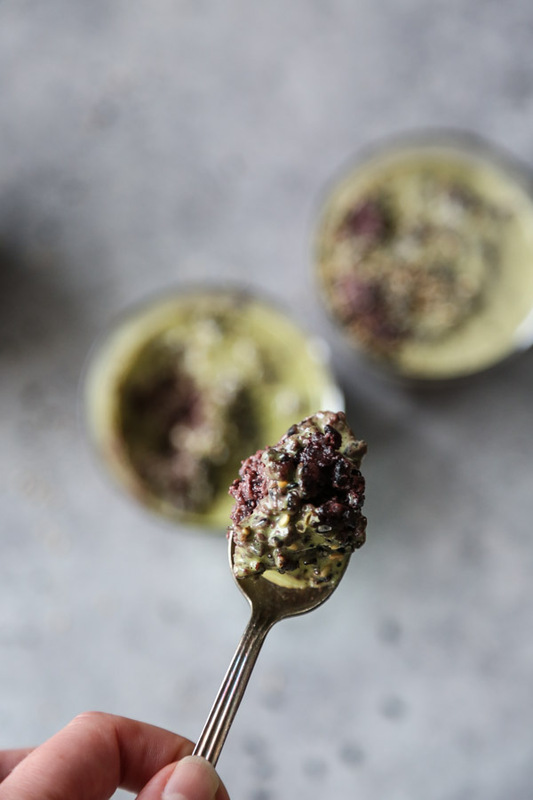 Stir in the tahini and cook a few minutes more, until the pudding is thick and creamy. When the pudding is your desired consistency, remove from the heat. 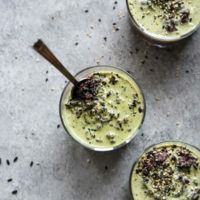 Meanwhile, while the rice is cooking, prepare the matcha cream: using a mixer with a whisk attachment or a hand mixer, whip the chilled coconut cream until light and fluffy. Add the remaining 1 tablespoon maple syrup and the matcha (to taste), whisking until the cream holds its shape. Divide the rice mixture between 4 ramekins or glasses, about ⅔ cup per vessel. 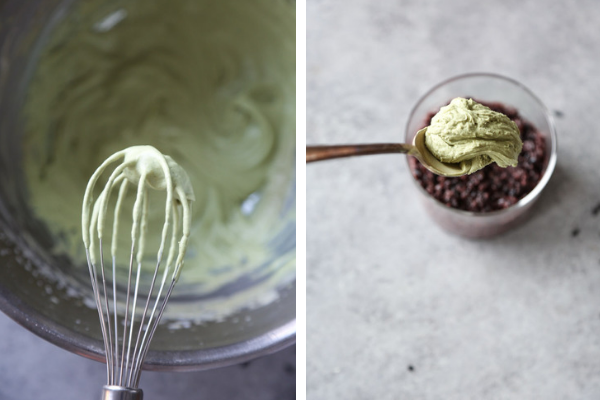 If enjoying hot, top each with a dollop of the matcha cream (warning it will melt). If enjoying cool down the line, cover and place in fridge for at least 4 hours and up to 2 days. 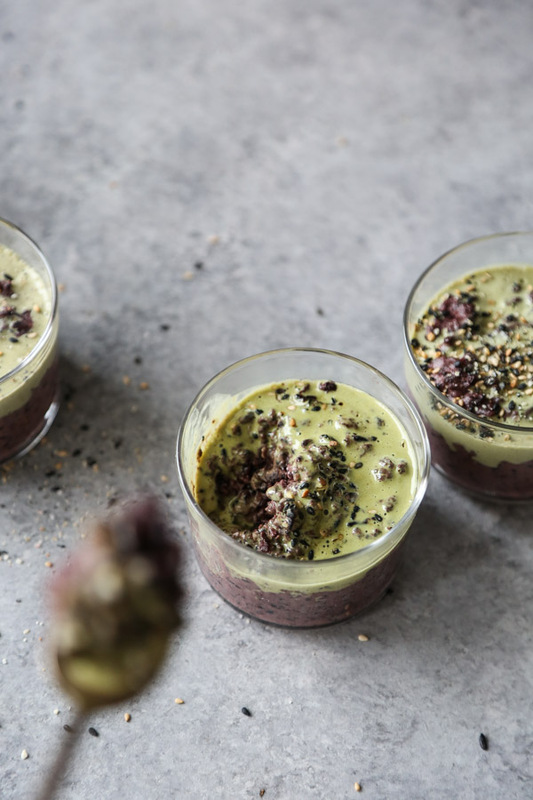 Store the matcha cream separately and garnish with toasted black or white sesame seeds. Wow. What a recipe and what an amazing presentation (as always of course)! Pinned! We are definitely trying this out. The only thing is, we won’t be able to get this black rice here, most likely. Would parboiled brown rice also work as a substitute in your opinion? And we are sorry in advance for asking this, hope you understand. I need to try this out this weekend. I have a feeling I’m really gonna like it. I hope you do Haley! 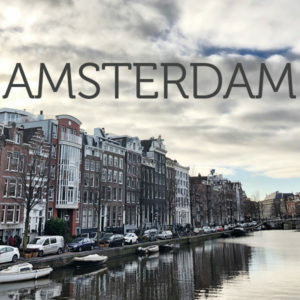 report back! Did it 2 days ago. Gurl…delicious. Found yourself a new follower. Gotta get these recipes.